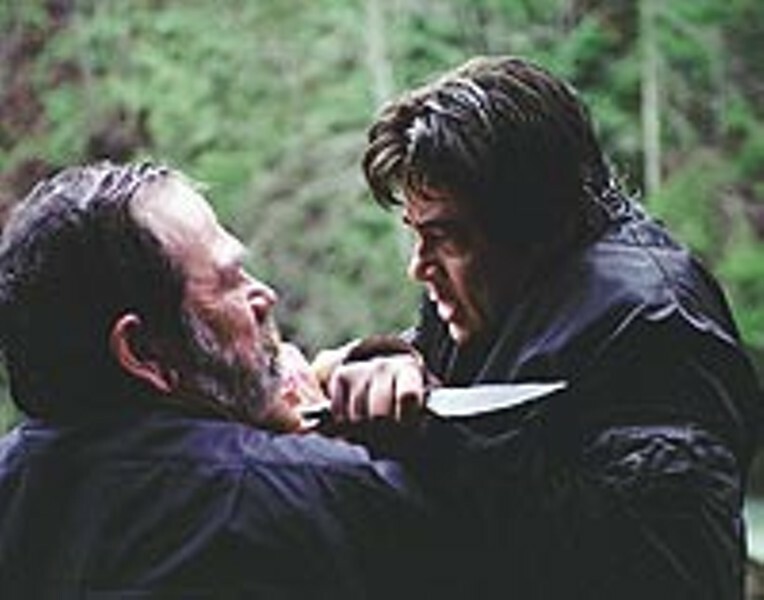 My valuable hunting knife: Tommy Lee Jones and Benicio Del Toro in "The Hunted." As his new movie, The Hunted, suggests, William Friedkin's career continues to wander into bizarre areas of subject and character and, not surprisingly, to display a flagrant and really quite inexplicable inconsistency. He has directed some excellent and influential motion pictures, most notably The French Connection and The Exorcist; in addition to some almost equally outstanding, if underrated and much neglected ones, like Sorcerer and Cruising; and, of course, a few grand flops, like The Guardian and Rampage. More to the point, he has also made some works that fall somewhere between the good and the bad, like To Live and Die in L.A. and Jade, films that promise a good deal more than they deliver, raising hopes and expectations in the audience that for one reason or another they never quite fulfill. The Hunted, alas, belongs in that last category. The movie purports to focus on the relationship between two similar individuals, in that traditional, powerful antithesis of the hunter and his quarry. Benicio Del Toro plays Aaron Hallam, a veteran of the Special Forces who experienced bloody combat in Kosovo. He's a trained assassin who's apparently burned out and even deranged by his profession of killing. When the FBI and the local police in Portland, Oregon, discover the mutilated bodies of four hunters --- apparently victims of Hallam's madness --- they seek the assistance of the man who taught him the assassin's trade, L.T. Bonham (Tommy Lee Jones), to track him down in the rain forests of the Pacific Northwest. That simple situation, which leads to Bonham's pursuit of his star pupil through urban and sylvan landscapes, pretty much comprehends the entire plot of the movie, and thus also underlines some of the movie's problems. Lacking anything beyond the most perfunctory gestures toward context and texture, the film must rely on a series of flashbacks to create any measure of complexity. There are flashbacks to Bonham's instruction of Hallam and his fellow killers, some of each man's memories of their shared past, and Bonham's reiterated statements about his quarry's ability to outfight and outwit the combined police forces of several municipalities, the FBI, and some shadowy figures from the CIA. This last group apparently plans to simply eliminate Hallam, because he knows enough to embarrass the government and the organization if he comes to trial. The central character of the troubled veteran, the Northwest setting, the connection between mentor and student, and even the situation itself, all resemble the first of the Sylvester Stallone Rambo flicks, First Blood, in which the protagonist holds off a whole town full of policemen and soldiers, armed only with his wonderful knife. In The Hunted, Del Toro also relies entirely on a special knife, a weapon Hallam learned to use and even to manufacture under Bonham's tutelage. As in First Blood, even a large force of heavily armed, well-equipped law enforcement personnel proves no match for a man with a blade. The knife so dominates the action that it even figures in the climactic chase sequence --- a sequence that must rank among the silliest and least likely moments in recent film. After Hallam escapes from his captors (killing three men in the process), jumps off a huge bridge into a raging river, and disappears into the forest --- with the older, hobbling Bonham somehow in close pursuit --- both men pause at the same time to make a knife. Bonham chips his out of flint or quartz, while Hallam builds a fire, tempers a piece of scrap steel in it, hammers it into a blade, and turns out a serviceable weapon --- a process that usually takes skilled artisans using sophisticated equipment many hours. In a short while, miraculously, the two meet for their final encounter. Any other possibilities that the film suggests apparently fell under that knife as well. Early in the action, both men separately appear dedicated to environmental work in different locations, preserving wildlife, punishing hunters and trappers. There's even a hint that Del Toro vaguely resembles some mythic spirit of the woods, but nothing develops out of that intriguing concept. When the voice of Johnny Cash intones some words of prologue from a Bob Dylan song about Abraham and Isaac, the audience might expect some echoes of the Biblical story, but that notion also disappears into the rain forest. The two actors perform adequately, but beyond their basic functions as hunter and hunted, there's very little about their characters that either requires or receives development. The scenery is spectacular, the stunts occasionally thrilling, but the story needs a good deal more than two men and a knife. Something, in fact probably several things, somehow went terribly awry in the complicated journey from conception to edited picture, placing The Hunted in that frustrating category of Friedkin films that begin well and end badly. The Hunted, starring Tommy Lee Jones, Benicio Del Toro, Connie Nielsen, Leslie Stefanson, John Finn, Jose Zuniga, Ron Canada, Mark Pellegrino, Lonnie Chapman; written by David Griffiths, Peter Griffiths, and Art Monterastelli; directed by William Friedkin. Cinemark Tinseltown; Hoyts Greece Ridge; Loews Webster; Regal Culver Ridge; Regal Eastview; Regal Henrietta.